All my work is about sensing history within the contemporary. 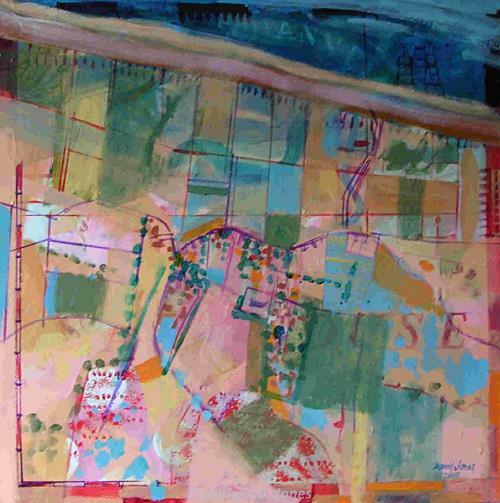 My work includes larger abstract paintings in oils, drawings in coloured inks, paintings of people in contemporary settings,prints and topographical drawings. What links them is that they all express an awareness of the past as an integral part of the fabric of the present. When working on the oil paintings I am aware that each painting itself has a history. As with many paintings they are the result of numerous sessions of work over a period of time. I see the development of a painting as a reflection of the evolution of what surrounds us. The process of gradual building of layers, scraping out, obliteration and repainting parallels the way for example cities and the landscape develop. Everything we see is in the last moment of a process of destruction and rebuilding but by the time our mind has taken in the experience, what we see has moved on. Our last glance is history. Just as evidence of the earlier history of a city or the nature of a landscape before human intervention can still be discerned in some places, and has been entirely erased in others, some of the first marks and layers can be seen in my paintings and others have been painted over and over again. Sometimes tiny areas of the very first layer, a ground colour, remain right through to the finished painting. I am conscious of this process of building, erasure and rebuilding whilst I am painting and of making a history albeit within the confines of a canvas. In parallel with the abstract paintings I also paint and draw figuratively. These pieces are often a record of the contemporary scene. They give me the opportunity to draw and paint people which I enjoy enormously. However they still lie within the same theme: at the instant of recording they become history. David Jones is contactable on 01603 663 047. David has also been inspired by St Nicholas' Church, Blakeney and St Margaret's Church, Cley-next-the-Sea. 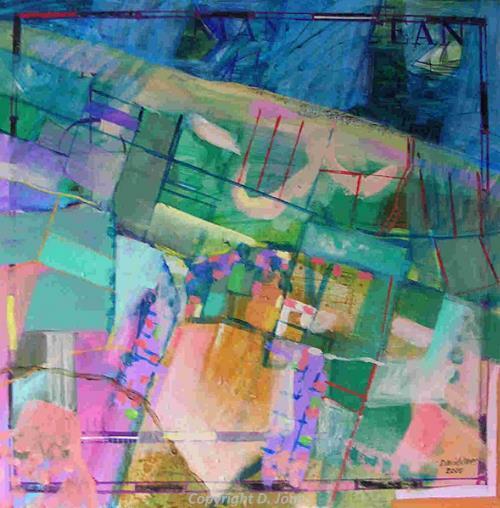 David used aerial photographs like that below as inspiration for these works. 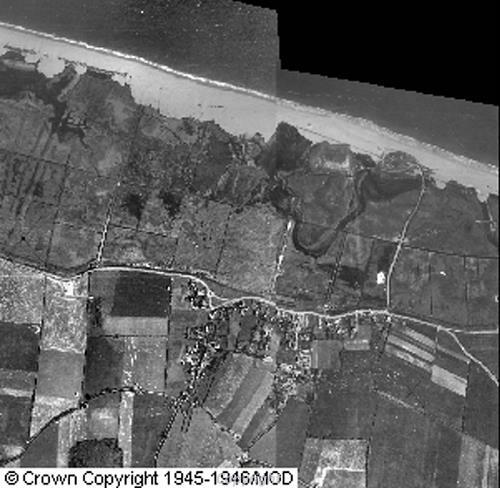 Similar aerial photographs can be viewed online at E-Map Explorer or at Norfolk Landscape Archaeology by appointment. Email heritage@norfolk.gov.uk, phone 01362 860 528 or write to Norfolk Historic Environment Record, Union House, Gressenhall, Dereham, Norfolk, NR20 4DR. Aerial photograph of the landscape around Salthouse.